I figure since it's been a while since I've put up any cool Aussie bird pics that some of you may knot know what I see each morning when I get up to go have a quick dip in the pool. Doesn't the facial expression of the galahs just sorta, kinda, MAYBE remind you of some particular Wasilla resident and ex-guv of Alaska? Ummmm, $arah, you aren't hiding very well. Just a reminder, I've named one of the galahs that sometimes come by the backyard Sarah Palin. 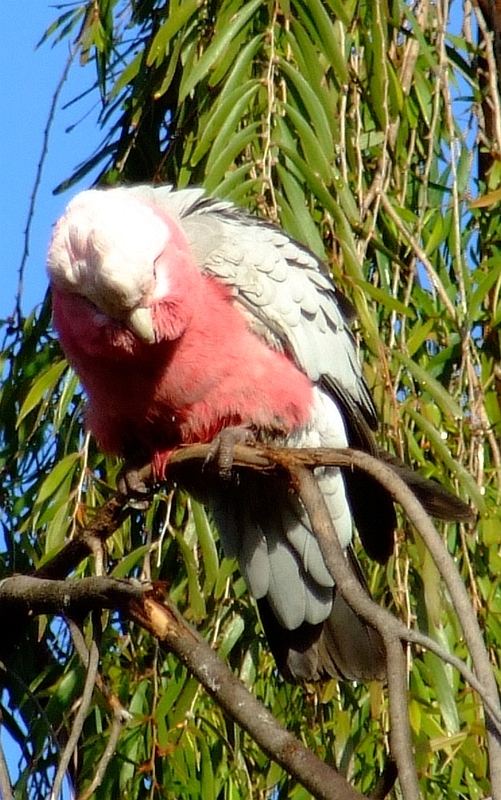 And another reminder, not only is galah the type of parrot but it is also Aussie slang for a nong, meaning twit or idiot. We haven't sent Scarah off to Mars yet? Dang. Ok, if you don't mind paying the postage on the dvd of SH race and fireworks!!!! Did I give you our permanent address - the one on Spinnaker Drive? anonymous: Nope, wrong movie. Guess again, no worries. SV Meerkat: Yep, I know where you are docked, no worries. I'll get it put together for you soon. Sarah Palin 2.0, so to say. One was more than enough. sciencebloke & Fizzgig: I won't be putting them up regularly like I did during the election, but it really is JUST. TOO. EASY. Oh, you want the title, too?